Summer vacation is over! I'm still not exactly sure where it went, but I'm excited to get back to school with my little ones. 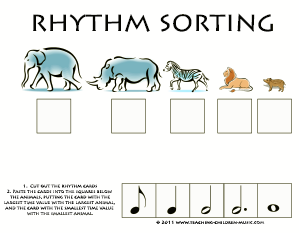 I have recently been focusing all of my "computer time" updating my e-book, "Rhythm for Preschoolers", and it is almost finished. Thank you to everyone who has given me feedback- it really helps. The following worksheet just didn't make the cut, but it's still worth sharing and maybe some of you will like it. My son loves cutting and gluing things, and to that end I made this little exercise. Enjoy!